About two decades ago, when I was active in the character education movement and writing grants to assist school districts with programs that taught young people such traits as trustworthiness, respect, caring, responsibility, and fairness, educators would use Coach John Wooden’s memorable quote as a teaching tool. We introduced children to literature that conveyed these principles for moral development and character formation and offered public figures that were exemplars of some type of virtue. For many of us, that was an exciting time, and the work was important. In the all-consuming political world of today, John Wooden’s words do not apply, for what is now done in public when everyone is watching serves as the true test of political character, and those universal traits and virtues, particularly among congressional Republicans, seem to be as scarce as the rarest elements on earth. It might even be the case that if any modern-day politician possessed any of the universal virtues, they should be included in what might be called a Virtuous Politician Periodic Table for the study of species extinction. The best and most recent evidence for the absence of character traits and virtuous behavior in a politician was displayed in the aftermath of the assault on Ben Jacobs, a reporter for The Guardian, by Republican Greg Gianforte, the winner of an open congressional seat in Montana. According to witnesses, hours before the polls opened, Gianforte choked and body slammed Jacobs after the reporter asked a question about healthcare. The silence from congressional Republicans about this assault on a representative of the Fourth Estate, someone in place to represent us as and ensure the vitality of the First Amendment, is deafening. In particular, the words on the subject by U.S. Rep. Steve Stivers, R-Upper Arlington, of Ohio’s 15th Congressional district, bring no comfort for those concerned about the damage this assault inflicts on free speech and the lesson it provides to young people. Never mind that the candidate Stivers was supporting choked and knocked down a representative of the press and lied about the incident shortly after it happened. The next day, after he won the seat, Gianforte apologized for the incident but never contacted the reporter directly before offering a half-hearted apology for the benefit of television cameras. Character is supposed to count for something. 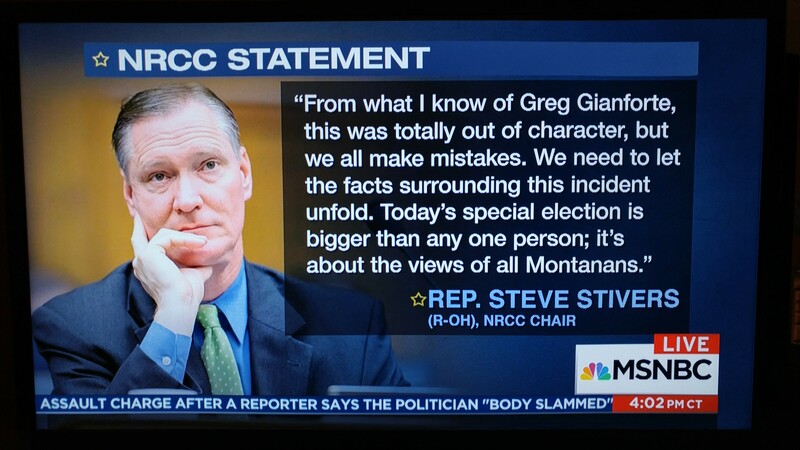 But what counts for Stivers and Gianforte is winning, at all costs. Stivers is not unique. His party, unfortunately, has become the champion of the Second Amendment and bullying, rather than a guarantor of the sacredness of the First Amendment, as Plunderbund readers read about a few weeks ago. So it was refreshing last week to actually hear an objection to the current transformation of the Republican Party from an institution that through most of its history stood for principled conservative values to what we see in its sorry state today. 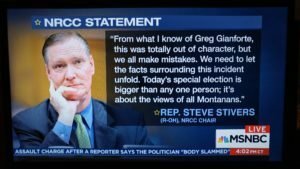 And the lack of values exemplified by today’s Grand Old Party is seen in Congress by the utter silence displayed by Stivers and the rest of the Republican leadership in the wake of Gianforte’s thuggery. Yes, the same party that constantly refers to “union thugs” is strangely silent about the subject of thuggery when it supports a real thug as he takes a seat to represent Montana in the Congress. That notable voice of protest, uttered by a Republican outside of Congress, has been raised, appropriately enough, by a former Republican member of the House. In reflecting about the dishonesty today in American politics, and particularly in his own party, Scarborough went further and posed this question. Scarborough is right. With Republicans, it seems that it is all about party first. In this equation, duty is not absent, but it is nevertheless needed to promote ideology. Since they have dishonored themselves by their silence in the face of thuggery, there is no longer any honor present in the party of Lincoln. When party and winning at all costs come first, something much more important is lost. In the case of Stivers, the congressman proud of his military service and his image in uniform as a defender of this country’s freedoms forgot about the freedom of the press and the First Amendment when he excused the behavior of Gianforte, a thug who assaulted a representative of that First Amendment freedom. On the same Morning Joe program, Robert Costa, the renowned Washington Post reporter, said that the Republican Party had a long history in honorably promoting conservative values. Now, with Donald Trump, Gianforte, conflicted cabinet members who act to destroy the very agencies they are sworn to lead, and the growing Russia investigation, the GOP is beginning to resemble part of a corrupt organization, a la the RICO statute. Indeed, the GOP is now all about a lack of core values, character, shameful conduct, and complicity in being silent about what is looking more and more like a drift toward authoritarian government. “Few Republicans expect party leaders to do anything to lessen the toxicity. As we witness the silence and complicity of the Republican Party as it continues to accept what was previously thought to be unacceptable behavior, some of us in the character education alumni group are also reminded about another quote that we used in our work. If we have a political party that has lost its core values, then that organization is fundamentally rudderless. That state of being creates a menace to society. With Stivers and others leading by silence, with the thug Gianforte being sworn in as the newest member of Congress, with the likes of Secretary of Education Betsy DeVos destroying public education, EPA Director Scott Pruitt disparaging climate research and weakening environmental protection, and with, of course, the serial offender Trump dismantling honesty, caring, respect, and every other endangered virtue still existing, today’s GOP truly represents a menace to society. Notwithstanding John Wooden’s definition, everyone is watching.